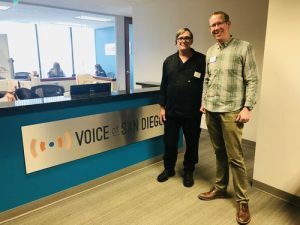 On this episode of ‘Homeless in San Diego: Real People, Real Stories,” host Greg Anglea, CEO of Interfaith Community Services, is joined by Bill Lewis, Head Chef at Interfaith. Bill walks Greg through his personal story of addiction and homelessness, and details how he was able to get clean, find a home, and eventually begin a journey of giving back by cooking for the clients of various Interfaith programs. Understand the importance of detox programs and advocating for more opportunities for people to get sober across San Diego County. Join our team! Interfaith is currently hiring Licensed Vocational Nurses for our Recuperative Care Program. Learn more by clicking here. Support Interfaith’s Recovery and Wellness Center. Recovery programs allow the problem of homelessness to start fixing itself but we need funding to keep the program going. Click here to make a difference today.